The Vitis Vinifera fair in Barcelona last week was an overwhelming assault of the top end portfolio from local distributor, Cuvée 3000 and was really too full of interesting wines to completely cover. 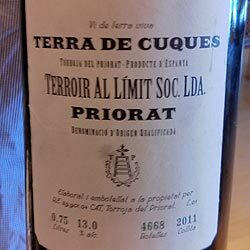 But, one bottle from Terroir al Límit was on everyone’s taste list, which was their newly released Terra de Cuques. This is the second white wine from this Torroja winery, the first being the very highly regarded Pedra de Guix. This bottle, which is reportedly mostly comprised of Pedro Ximenéz with a smaller portion of Muscat has a curious name which literally means, “bugs’ earth”. It’s curious not just for the direct translation, but also due to the soils in Priorat being extremely poor, slatey soils that wouldn’t seem as if they’d be terribly bug-prone. Whatever the case, it seems that Dominik Huber has created another fine bottle. Some of the people we talked to had mixed reactions to it, but for us, it’s a solid, expressive white, especially when taken in the context of Priorat. Read more about Terroir al Límit and other Priorat wineries in our upcoming Priorat guide.